The flash of ambulance sirens. The wheels of a stretcher coasting along the linoleum floor. The clamor of voices working to resuscitate a patient. These are the sights and sounds from any of the country’s emergency departments, where more than 1,000 people per day are treated for improper use of prescription opioids. People who are prescribed opioids to manage pain are at significant risk for misuse, abuse and addiction. Physicians are tasked with an immense responsibility to provide treatments that will safely and responsibly alleviate pain while preventing unnecessary risk. This was apparent to Kaiser Permanente leaders about nine years ago, which prompted them to identify safe opioid prescribing as a major challenge and goal. The result is a broad, systemwide approach committed to quality and safety to better manage the prescription of painkillers. The Permanente Medical Groups — the 8 physician groups exclusively providing care for Kaiser Permanente patients — developed the “Four-Pronged Approach to Safety,” an initiative focused on physician education and support, community protection, patient safety and patient education. The initiative’s focus areas are advanced and supported by components such as telehealth, pain communication, thought leadership and program innovation. The following are examples of how the PMGs are intervening to address the opioid crisis within Kaiser Permanente, helping to serve as a model of how the rest of the country can address the opioid epidemic. 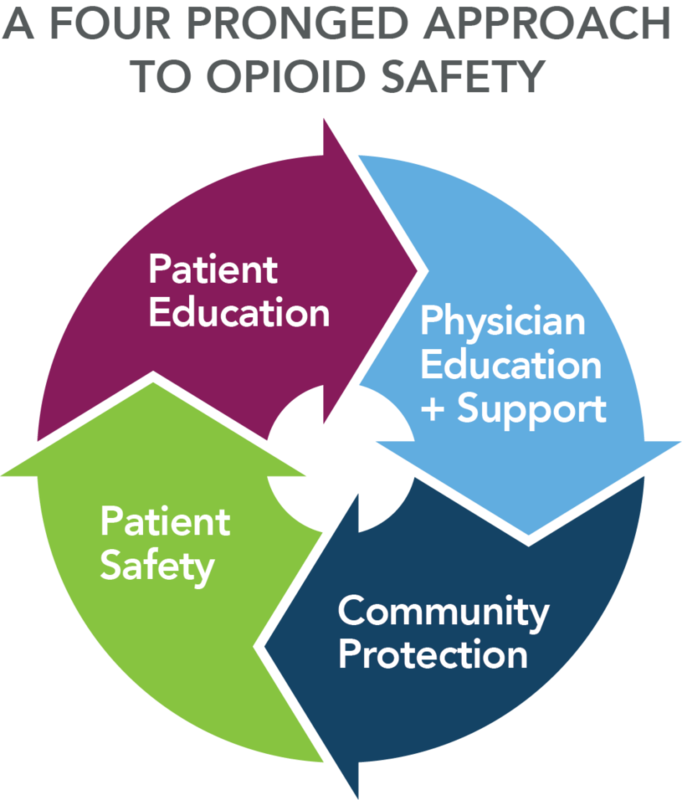 Permanente physicians often take opportunities to spread best practices, and opioid safety is no exception. Last October, Edward Ellison, MD, SCPMG’s executive medical director and chairman of the board, testified before the President’s Commission on Combating Drug Addiction and the Opioid Crisis. He described the Safe and Appropriate Opioid Prescribing Program and some of its positive outcomes to date. The Southern California Permanente Medical Group was the first PMG to implement the Safe and Appropriate Prescribing Program. The program provides robust training to physicians to ensure consistency in treatment of acute and chronic pain, as well as monthly reports on opioid safety metrics and prescribing patterns. In Northern California, Sameer Awsare, MD, associate executive director at The Permanente Medical Group, created the group’s Opioid Initiative, an education program for physicians, clinicians, and pharmacists that highlights national trends, appropriate treatments for different conditions and alternatives to opioids. Internal data for the Northern California Region showed that in 2016, two years after the program was implemented, the number of patients on high doses of opioids fell by 43 percent. In the greater Atlanta area, Kaiser Permanente Georgia care team members organized an Opioid Oversight Committee to develop an overall approach to reducing opioid use. Committee members developed educational and related tools regarding the region’s policy for long-term prescribing, which incorporates guidelines from the Centers for Disease Control and Prevention. Kaiser Permanente’s electronic health record system is instrumental in arming physicians with the tools to help in the fight against opioid abuse. For example, Mid-Atlantic Permanente Medical Group care team members can access the Chronic Opioid Therapy Management Smart Set through the organization’s electronic health record. This decision-support technology serves as a guide for best practices when treating patients with acute and chronic pain, and can help flag high-risk scenarios. Under Dr. Forster’s leadership, high-dose opioid prescribing in the Kaiser Permanente Mid-Atlantic Region has fallen nearly 70 percent from 2012 to 2017. During that time, MAPMG physicians began to offer patients additional resources such as non-pharmacological therapies, non-opioid pain medication regimens and a greater variety of pain specialists. The ability to understand and talk about a patient’s pain helps Permanente physicians develop an appropriate treatment plan for their patients. For that reason, the Hawaii Permanente Medical Group created the Empathetic Pain Conversations program, which offers information and support to physicians on how to speak to their patients about pain and opioids. The curriculum is designed after Northwest Permanente’s Pain Communication Skills Intensive and includes topics such as active listening, adverse effects of opioid medications, the mind-body connection, and using empathy. Following the program, Permanente physicians have reported feeling more empowered and equipped to manage their own feelings and handle challenging patients. In the Kaiser Permanente Northwest Region, an Opioid Use Improvement program has played a role in reducing the amount of high-dose opioid prescriptions in Oregon. For example, patients at risk for long-term usage of prescription painkillers receive letters from their primary care physicians, a first step in creating a personalized, long-term pain management plan. The care team then schedules appointments to review the patient’s prescriptions, and an appropriate treatment plan is developed between the patient and doctor. Today, both Kaiser Permanente medical centers in Oregon — Sunnyside and Westside Medical Centers — are among the lowest prescribers of opioids in the state. The Permanente Medical Groups’ leadership in opioid safety extends beyond clinical care and into the medical community. Each year, MAPMG physician leaders host an all-day pain summit to share evidence-based approaches and best practices for pain management. In addition to featuring national speakers and local experts, the summit offers continuing medical education credit to eligible attendees. 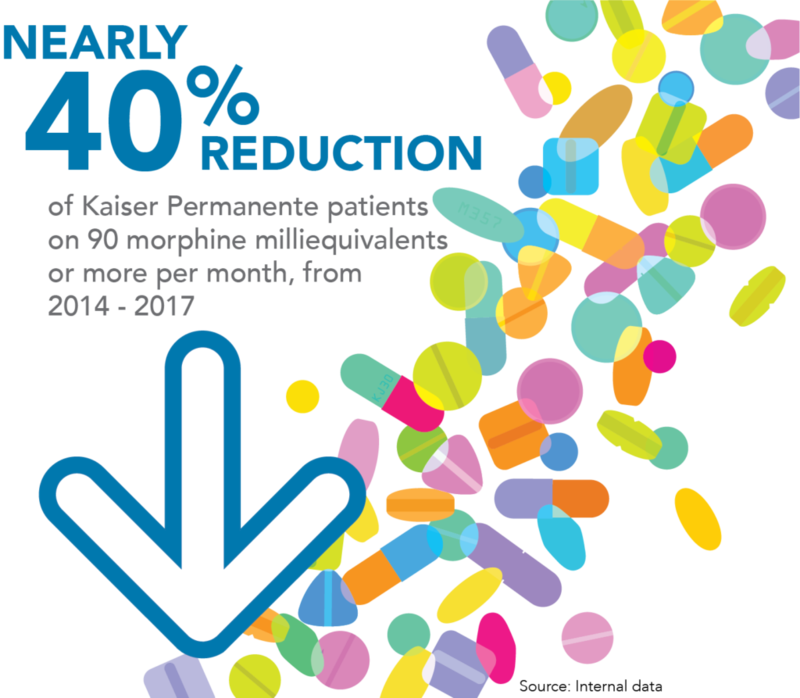 Since its expansion to all Permanente Medical Groups, Kaiser Permanente’s opioid safety initiative has drastically reduced high doses of opioid prescriptions over the past 3 years (see graphic). Dr. Awsare attributes Kaiser Permanente’s success to the collaboration, coordination, and communication between pain management leadership, multi-disciplinary care teams, and physicians. “We are constantly working together to best support our members and patients in managing their pain and achieving their healthiest lives possible,” he says. Watch this video to see how our physicians working with our clinical pharmacists are addressing safe opioids use in Colorado.